We already know two the most important advantages of E-ink screen - energy consumption is very low and there is no inner glow which irritates eyes. It can be seemed that because of backlight of the screen all advantages should disappear. But it is not quite so. Let's descry the history of appearance of the screens with function of backlight. One of institutes of USA held researches and their results shown that sprouses in many families don't sleep together as at the time when one of them wants to sleep another one wants to read a book. This fact has become a premise to making of E-ink screen with backlight. So the function of backlight was made first, for not very long reading in the darkness and second, for reading with a small level of backlight in rooms with not very good illumination. It wasn't easy to invent such screen. It's known that displays made by technologies IPS and TFT have transparent screens and matte screen substrate (light guide), which evenly distributes light is lighted with help of fluorescent lamps or LEDs. Screens which are made by E-ink technology are not transparent, so it's useless to light them in such way. In this case, the light source should be situated above the screen and the light should spead almost parallel to screen how it usually happens when the car is lighting the road by headlights. Hence, immediately arises problem of providing the uniformity of lighting of the screen. An American corporation Amazon was the first who offered a variant of solving this problem in a model Amazon Kindle Paperwhite. The lightning is made by four LEDs. They're situated at the bottom of the e-book and light not the screen but the transparent plate, which covers it. You can not only turn on and off the backlight but also manage it in very big limits. After Amazon, a reader with backlight was made by American company Barnes & Noble (the model NOOK Simple Touch with GlowLight). The backlight is made by 8 LEDs which are situated at the top of the e-book and instead of the transparent plate there is a special light diffusing layer. If you're buying this book - be careful, as you can scratch the layer. Then, the function of backlight began to appear from many manufacturers and technology of production of them was not different from Kindle or Nook. But company Sony has chosen completely different way and it continues producing e-books without backlight. 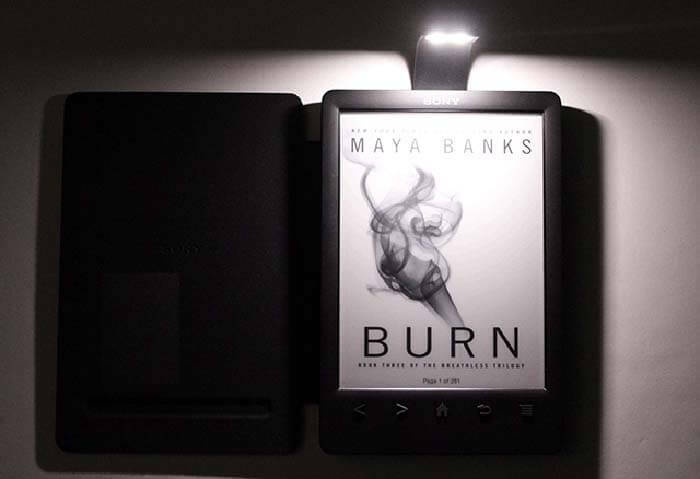 Sony equiped the cover of its' book with a special retractable flashlight, which is powered from battery of reader. It should be noted that the backlight effect on battery consumption and reduces battery life from several weeks to 10 - 30 hours. Naturally, this mode is not designed for constant use. View models of electronic books with backlight function can be in the table of parameters, and learn more about the models E-ink screens you can in the article "Screen Types of e-books".